Organic. Dairy-free. Unsweetened. Made with 3 natural ingredients - cashews, water and a pinch of sea salt. No additives or stabilisers like oils, gums, lecithin or carrageenan. Great taste 2017. Awesomely vegan. Our dairy-free drinks are all organic, using only a handful of natural ingredients with absolutely no additives, sweeteners or stabilisers like oils, gums or lecithin. 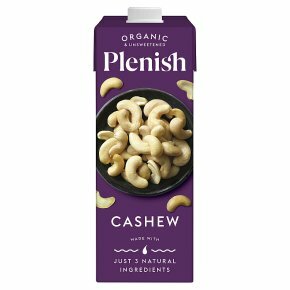 We only use organic, sustainably-sourced cashews of the highest quality and pack many more into our drinks than the average brand so that you enjoy pure taste without compromise, safe in the knowledge that you're getting everything you need and nothing you don't. Get More In Get More Out Power-up your porridge Supercharge your shake Level-up your latte Maximise your meals To get started, just... shake well Use 250ml of this organic cashew drink per day as part of a balanced diet and healthy lifestyle.